Asking For Toilet paper can be one of the biggest things you can do for yourself to prepare for baby’s arrival. Now I know that sounds strange to most of us here, but for the clients who have worked with me know what it’s all about. We often leave the hospital, sent home with our baby trying to figure out things on our own. We are a bit nervous about breastfeeding, breathing patterns of a newborn, healing our body and also thinking about introducing this new miracle to the people we love. We become overwhelmed at trying to entertain people and trying to get enough sleep. What ends up happening is struggle to talk with our partner, we become tired frustrated and bit on edge. Our house is a mess, we haven’t showered and our partner is trying to put together a meat and cheese platter to appease everyone! When you take a few simple steps and actions your life with a newborn can have a sense of ease, enjoyment and even indulgence. First off get it out of your head that you are supposed to do it all by yourself. Give up your expectations of how your house is supposed to look (at least for the first few weeks) You do not have to do it on your own, and so, guess what? It won’t look the way you do it. So what does toilet paper have to do with it all? You will always need it. And Parent continues to do everything by themselves and alone. 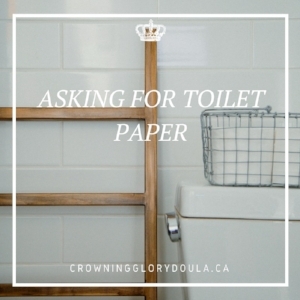 Toilet paper is simply a tool my clients use to remind themselves that they have the power to ask for their needs to be met. You see there is a sense of contribution and power when families give themselves permission to accept help. You see, it gets us to practice asking what we need. It has us remind ourselves that once people are at our place we can also have our needs met. Think about the dishes, laundry that can be folded and some veggies prepped for dinner. Heck, once I started learning this all myself, I even accepted an offer from a friend to clean my bathroom! (after I had given birth in there) It also allows for good feelings all around. The friend feels great that they could make a difference for you and baby, and people offer help because they want to…. Well, help! It takes a village to raise a child, but it’s not about having that child cared for directly, but having you create your village so that your village can contribute to you. My clients from around North America and locally know that they have the power to create a powerful postpartum, and it starts in Pregnancy. This is just the tip of the transitional iceberg. I had 4 children before I realized the importance of a restful postpartum. It took me asking for what I needed, getting enough rest and giving up my expectations. So while these steps are simple to having an amazing transition into parenthood, it can take a little extra help or coaching to have it become a reality and that is why I have opened up some time in my calendar. If you are ready to change your life with baby (while still pregnant) then lets hop on a call.